Was it really over two years ago that the technological marvel of NASA’s Curiosity space rover launched from our blue marble to begin its tour of the Martian landscape? Yet, the rover is merely one of a succession of rovers that have redefined the public conception of space exploration. Though many (myself included) may harbour an idealistic vision of space-farers, fuelled by cinema hits like Star Wars and Star Trek (both old and new), the reality presents a bleak vision of budget cuts and administrative indifference. 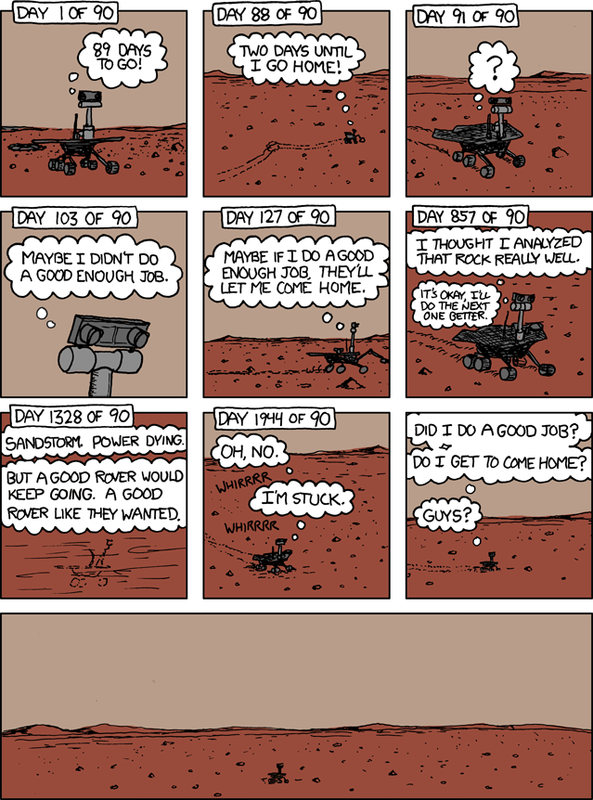 The Curiousity Rover has been autonomous for the past 10 months so far. Give ’em another 700, and we’ll have a Pixar movie in the making! 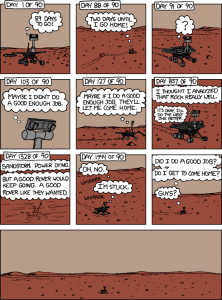 This entry was posted in Random Meditations, Uncategorized and tagged Curiosity rover, resilience, science, space exploration. Bookmark the permalink.